With the use of high–yielding varieties of crops, the use of fertilizers and pesticides has increased a lot. Excess fertilizers may mix with surface water and may get drained into water bodies (surface runoff). These fertilizers overstimulate the growth of algae, causing eutrophication, and robbing the water of dissolved oxygen vital to other aquatic life. During the past century, lakes in many parts of the earth have been severely eutrophied by sewage and agricultural and industrial wastes. The phenomenon of a sudden increase in the organic and inorganic nutrient supply in an aquatic environment is referred to as Eutrophication. These nutrients are basically nitrogen and phosphorous, and they favor overgrowth of algae and grazing bacteria, which then results in oxygen depletion. It is also termed as the natural aging of lakes or rivers. It is a natural process and takes thousands of years. Organic pollutants from man’s activities like effluents from the industries and homes can radically accelerate the aging process. Thus, this phenomenon is also called anthropogenic or man-made eutrophication. Runoff from agricultural fields, urban lawns, and similar sources may increase the flow of nutrients and organic substances into the aquatic ecosystem. Domestic Sewage is rich in nutrients, especially, nitrogen and phosphorous, which cause eutrophication and nuisance algal blooms. Organic pollutants from sewage effluents overfeed heterotrophic bacteria, depleting the dissolved oxygen. Sewage was the primary source of phosphorus eutrophication of lakes in the 1960s and 1970s when detergents contained a lot of phosphates. Phosphates are powerful stimulants for algal growth. Thus, the addition of phosphates from detergents and fertilizers can lead to an algal bloom in which algae overgrow the water surface. Nitrogen from sewage effluents is another nutrient that can lead to algal blooms by relieving nitrogen limitation. 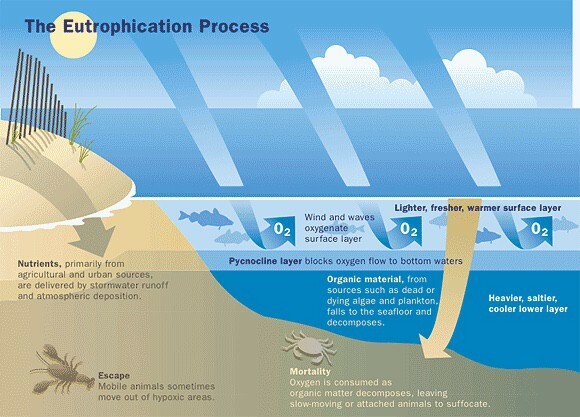 Figure: The process of eutrophication in coastal water bodies. Overgrowth of algae can interfere with the health and diversity of indigenous fish, plant, and animal populations. It can also limit the recreational use of lakes and estuaries. Algal blooms can fully cover up the water surface and block sunlight, which causes the death of underwater plants and animals. Consequently, when the algae die, then whose decomposition further deplete the water’s dissolved oxygen content. Fish and other marine animals may die due to depletion of dissolved oxygen. This may lead to a decrease in aquatic biodiversity. Some algal cells present in the algal blooms may also produce certain harmful toxins. These toxins are harmful to fishes and birds may cause certain diseases in humans e.g. diarrhea, gastroenteritis, nausea etc. 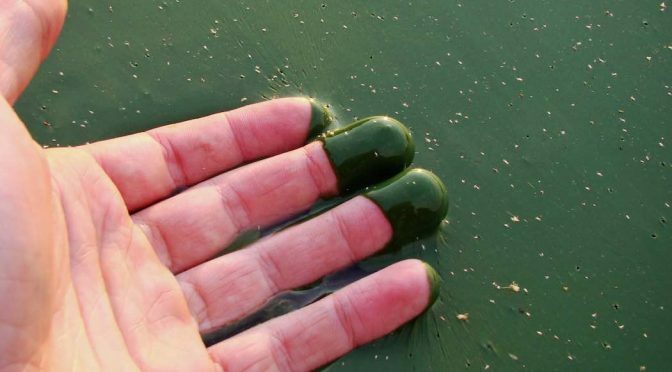 The growth of algae can be inhibited by using algicides such as copper sulfate, sodium arsenate and 2, 3-dichloro-naphthoquinone. Previous PostHow do cells in Embryo get their Roles to Play?Next PostWhat are the different Causes of Antibiotic Resistance?